The truth about special occasions is that they can be lighthearted, emotional, and fun-filled, all at the same time. So you better make sure you have the gift that says it all! This gift package includes 3 red roses of only the freshest, choicest variety and 1 heart-shaped balloon displayed in a classy glass vase, plus a lovable stuffed bear. Priced affordably at only $58, it gives you 5 brilliant ways to make someone else's day. 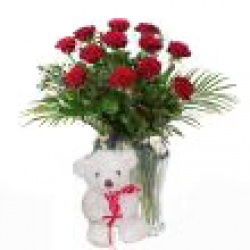 This gift package is ideal for Valentine's Day, Birthdays, occasions for Roses, and occasions for Bears and Balloons. For Feb 13 and 14 delivery within Metro manila only. While the rest of the world eagerly awaits their one true love, let yours know that you\'re no longer looking. Say, I Love You, in ways big and small with this stunning gift package. Priced within budget at only $78, it includes only the freshest 1 dozen roses of excellent variety arranged elegantly with fillers and ferns in a vase, plus a fine-quality medium-sized stuffed bear. This gift package is ideal for Valentine\'s Day, Christmas, and occasions for Bears and Balloons. To the lucky one who knows that deep inside you is a basketful of sweetness, no gift is more perfect than lovably colored roses and a bear in a basket. This gift package consists of only the freshest 2 dozen red and white roses of premium variety, arranged elegantly in a fine-quality basket with an endearing stuffed bear, all for the budget-friendly price of only $128. This gift package is ideal for Valentine's Day, occasions for Bears and Balloons, and the arrival of a New Baby. Thank the stars for giving you someone who is full of love and radiates all that is beautiful in life. Surprise your loved one with a burst of heartfelt emotions through a truly touching gift. At a budget-friendly price of only $88, this gift package includes the most endearing medium-sized stuffed bear on a bed of only the freshest, choicest quality 1 dozen roses. This gift package is ideal for occasions for Bears and Balloons and the arrival of a New Baby. May choose the color of roses depending on it's availability. Sky?s the limit of new beginnings you can create with flowers and balloons. 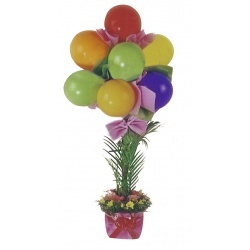 Spark fresh optimism with this gift package priced affordably at only $68 , it includes 10 assorted 11-inch balloons arranged on a 3-foot tall bamboo stand consisting of only the freshest, select-quality assorted flowers. Lift up the spirits of loved ones with a gesture of love that is fresh and welcoming. This gift package is ideal for Birthdays, Inaugural occasions, occasions for Congratulations, and occasions for Bears and Balloons. consist of 2 doz. gerberas and mums in a basket with balloons arranged elegantly with fillers and ferns. 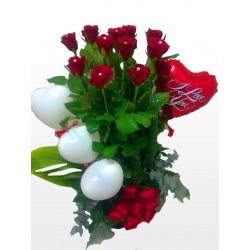 This gift package consist of an elegant spring bouquet with a small bear and a heart shaped ferrero chocolate. Consist of 1 box 3 red roses with a small heart bear. 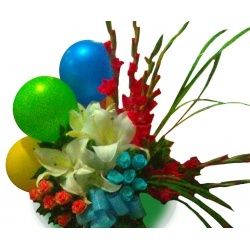 Spring balloons consist of liliums, roses and gladiolas arranged elegantly on a basket with 3 balloons. Perfect for all occasions. Your loved one may be getting a thousand heartfelt wishes but imagine her surprise if half of them actually came from you! Priced within budget at only $99, this feast of a gift package consists of only the freshest, premium-quality 1 dozen red roses and white liliums with 4 heart-shaped balloons and an adorable medium-sized stuffed bear. This gift package is ideal for Birthdays, Valentine's Day, and occasions for Bears and Balloons. Who can blame you for falling for someone whose radiance is only matched by her elegance? Let her know what you love most about her with this gift package priced affordably at only $48. It consists of only the freshest 1 dozen gerberas arranged adorably with a medim baer, cookies and chocolates. This gift package is ideal for Birthdays and occasions for Bears and Balloons.